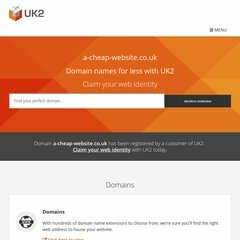 A-cheap-website is ranked 3,779,523 in the United Kingdom. Its 2 nameservers are ns2.mainnameserver.com, and ns.mainnameserver.com. Its local IP address is 79.170.44.103. Its web server is located at Heart Internet Ltd England. PING www. (79.170.44.103) 56(84) bytes of data. A time of 99.6 ms, is recorded in a ping test.